Please contact the Spanish, Mexican, Argentinian and other Hispanic population embassies to end the archaic savagery of bullfighting. of what their money does to the bull. throughout Spain as has been done in Barcelona. It is time for the entire Hispanic world to end this public spectacle of savagery. Pope Pius V was not a believer in nonviolence. However he condemned bullfighting. Pope Francis is a believer in nonviolence. May he now condemn bullfighting. A few minutes later, another bull enters the arena and the sadistic cycle starts again. If you are planning to visit a country that permits bullfighting, please tell your travel agent that you are opposed to cruelty to animals in any form and that you do not want tickets to bullfights included in any tour packages. Before vacationing abroad, you can write to the country’s ambassador and ask whether rituals involving animal slaughter are among the country’s tourist attractions. 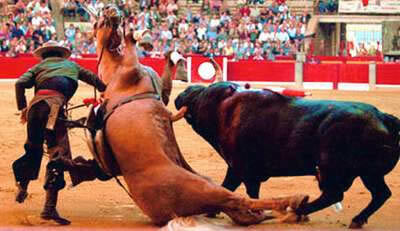 Make it clear that you want no part in such activities, and never be afraid to talk about the cruelty of bullfighting. Please write to the Spanish, Mexican, and French embassies and explain that as long as this cruel blood sport continues, you will never visit these countries. 1) Alex Duff, “Bullfighters Say Hollywood May Rescue Spain’s Dying Tradition,” Bloomberg.com, 5 Apr. 2006. 2) Leslie Crawford, “Life in a Cloak and Dagger World,” Financial Times 30 Jul. 2005. 3) Darwin Porter and Danforth Prince, Frommer’s Spain 2010 (Hoboken: Wiley, 2009) 26–7. 4) Laurence Lowe, “The Justin Bieber of Bullfighting,” Details Dec. 2010. 6) Todd Venezia and Ginger Adams Otis, “Matador Gets Spain and Suffering,” New York Post 22 May 2010. 8) Pope Pius V, Bullarum Romanorum Pontificum, Vol. 4, 2nd Part, 1567, 402–4. 9) Fiona Govan, “Bullfighting’s Future in Doubt,” Telegraph 20 Dec. 2006. 10) Al Goodman, “Spain’s Catalonia Bans Bullfighting,” CNN, 29 July 2010. 11) Raphael Minder, “In Catalonia, A Last Day of Bullfighting,” New York Times 25 Sept. 2011. 12) “Bullfight Opinion Poll: As Spain Debates ‘Support for Bullfighting’ Bill, Most Spaniards Oppose Use of Public Funds for Cruel, Waning Bloodsport,” Humane Society International 23 Apr. 2013. 13) Abigail Wild, “On the Horns of a Dilemma,” The Herald 25 May 2005. 14) Tom Hundley, “Ole! Fading Away,” Chicago Tribune 8 Sept. 2006. 15) Keith Johnson, “Besieged Bullfighting Finds Young, French Savior,” The Wall Street Journal 24 Jul. 2006. Each year, thousands of bulls are barbarically slaughtered in bullrings around the world. From the moment they enter the ring, the bulls don’t stand a chance. They may be weakened by beatings, have their horns shaved to keep them off balance, or have petroleum jelly rubbed into their eyes to impair their vision. In a typical Spanish bullfight, the bull enters the arena and is approached by picadors—men on horses who drive lances into the bull’s back and neck muscles. This attack impairs the bull’s ability to lift his head and defend himself. They twist and gouge the lances to ensure significant blood loss. Then banderilleros enter on foot, distract the bull, and dart around him while plunging banderillas—brightly colored sticks with harpoon points on their ends—into his back. When the bull has become weakened from blood loss, the banderilleros run the bull in circles until he becomes dizzy and stops chasing them. Finally, the matador appears and, after provoking a few exhausted charges from the dying animal, tries to kill the bull with his sword. If he misses, succeeding only in further mutilating the animal, an executioner is called in to stab the exhausted and submissive bull to death. The dagger is supposed to cut the animal’s spinal cord, but even this stroke can be blundered, leaving the bull conscious but paralyzed as he is chained by his horns and dragged out of the arena. If the crowd is happy with the matador, the bull’s ears and tail are cut off and presented as trophies. A few minutes later, another bull enters the arena and the sadistic cycle starts again. Most tourists don’t know that all the bulls who run in the streets of Pamplona, Spain, are later killed in the bullring. Before the runs, the bulls are kept in crowded, dark enclosures, and when they are prodded onto the streets, they are momentarily blinded by the sunlight. Runners hit them with rolled-up newspapers. The panicked animals can lose their footing on corners and crash into walls, possibly breaking bones or otherwise injuring themselves. They will be stabbed to death at the end of each day. Around the world, opposition to bullfighting is growing. In July 2010, Catalonia’s Parliament banned bullfighting, and in May 2013, the Mexican state of Sonora did the same. In October 2013, France’s Green Party introduced a proposal to ban killing bulls. In 2011, Ecuador banned killing animals for entertainment. After Portugal’s municipality of Viana do Castelo banned bullfighting in 2009, the city’s mayor said, “The defence of animal rights is not compatible with spectacles that torture and impose unjustifiable suffering.” From 2008 to 2013, attendance in Spanish arenas fell by 40 percent. In 2008, about 3,300 bullfights were held in Spain. In 2012, they dropped to less than 2,000, and in 2013, it’s expected that less than 500 bullfights will be held. Despite the name, Portuguese bullfights are anything but bloodless. The bull is stabbed with banderillas by a matador on horseback, causing deep wounds and significant blood loss. The bull is then tormented by eight forcados, seven of whom grab the animal’s head while the eighth pulls on his tail, eventually stopping the exhausted animal. The bull is not killed in the ring but dragged out and left bleeding to await his slaughter, hours or even days later. Bulls aren’t the only victims in bullfights. Horses are used to run bulls in circles, are viciously spurred, and can quickly become exhausted. Horses can be seriously gored or killed by charging bulls trying to protect themselves. They’re also forced to pull the bulls’ dead bodies out of the ring.